the well informed and appreciative amongst you will likely have had cause to experience apple computer's adventurous and stylish packaging. based on the percentage of windows based machines in the world, much of this may have been via those smoothly crafted boxes in which ipods reside. if we're perfectly honest with each other, the packaging is just as big a part of the consumer experience as the item that has been packaged. unfortunately, this is an aspect of industrial design that the bicycle industry has either chosen to ignore, or one that sneaked up while it was looking the other way. the gnashing of expectant teeth (there's a phrase you don't hear too often) can now reach a state of eqanimous equanimity, as i can now let you know what was in that mystery package, tantalisingly not revealed just before christmas. those who have experience of receiving packaged bicycles will know of which i speak. either a thin box apparently filled with a year's worth of bubble wrap and corrugated cardboard held together with zip ties, or those ready to ride boxes favoured by the few, on which council tax and stamp duty is likely due. neither enhance the experience of receipt in any satisfactory way. you and i are both desperate to dispense with the above as fiendishly quick as possible, and get to the main business of the day. jay sycip, the affable chief of staff at cielo bicycles, has our very best interests at heart, making sure that those of us in receipt of a cielo frame, and ancillary components, will enjoy the experience from start to finish. thus, that hitherto unheralded box that has explored much of the scottish mainland, is more than just a bike in a box. shipped all the way from north west nela street in portland, oregon, via federal express, this particular black, steel, chris king cielo frameset was almost too good to be true. 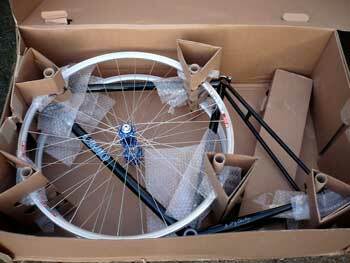 for not only did the box contain frame and forks, but chris king's latest r45 race wheelset, built on a sparkly blue pair of the latest swift hubs. but instead of pulling hard on top flaps to get at the contents, this cielo emblazoned box, of thinner recycled card than is usually the case, bears printed instructions on which side is to be placed face down when opening. rather than the box remaining vertical, the cielo package is set on the ground like a large chocolate box; cutting carefully through the tape keeping it closed, the lid is opened upwards and away from the drooling recipient (you'd better believe it). inside, accompanied by the absolute minimum of bubble wrap, top to bottom was the frame sandwiched between a front and rear wheel. the lack of bubble wrap was of no concern whatsoever, since five, slotted triangulated towers of card kept each layer from interacting with those below and above. 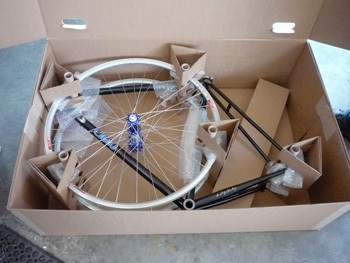 to prevent any of the above bicycle parts from shifting in transit, the inward facing point of the triangle featured a vertical cardboard tube, which not only retained the wheels in situ, but prevented any untoward external activity from collapsing the box on its contents. the forks were contained inside a smaller box taped to the bottom surface. if you doubt the strength and integrity of this arrangement, bear in mind that edifice had endured the following: fedex to pdx; flight to glasgow via amsterdam; fedex to inverness (yes, really), oban express from inverness to oban, then on to mundells' at tarbert. haulage from tarbert to the calmac ferry before delivery to washingmachinepost cottage. the top photo shows the box in portland prior to departure. the next pic shows it after a day or two on islay. why, i hear you ask, was it still in the selfsame box after a few days on islay? surely my eagerness could not have let it sit in its cardboard enclave for that length of time? well, as i have alluded to above, packaging the cielo in this manner, aside from the necessary degree of pragmatism, was designed to enhance the customer experience. and i don't mind telling you that every day since it arrived, i have extricated the box from its residence in the bike shed, and simply opened and stared, before putting it back to do the same next day. 'appreciate, appreciate...' as billy connolly would have said. 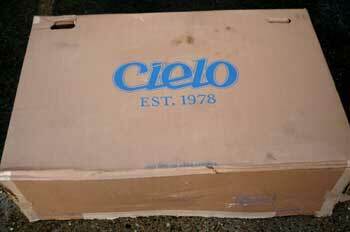 how often do you take delivery of a cielo frame? chris king cielo frames can currently be had all across the usa, either direct from portland, or from river city bicycles n the selfsame city. the latter are likely to sell you the cielo as a complete bicycle, but if you order direct, your frame (and wheels, if applicable) will arrive in the selfsame manner; it's the modern way. the cielo that currently resides in bowmore is, as far as i know, currently the only one in scotland, and likely the uk. this, however, will not always be the case, as the uk chris king importers, evolution imports, expect to start bringing these across the atlantic within the foreseeable future. the metallic black example that has spent the afternoon on my workstand will be the subject of a long-term test, fitted as it is with a chris king sotto voce no-threadset, and chris king bottom bracket; all in the same wonderful blue anodising that identifies the wheels. i intend to post a veritable slew of photos and likely create a cielo link on the navigation to your left, where relevant articles such as this one will be safely stored for your reading pleasure. from now on, i'm thinking outside the box.